The Purple and WhiteWarner Bros. vs. Disney: Who’s the Better Cartoon? Warner Bros. vs. Disney: Who’s the Better Cartoon? Warner Bros. and Disney have produced what arguably are the greatest cartoons ever made by American animation studios, but which studio made the better cartoons? To find an answer to this question, analyzing each studio’s style in their classic cartoons might be the best move to make. Classic Disney cartoons, starring characters like Elmer Elephant (from the cartoon of the same name) and Mickey Mouse, are very bright and colorful, and usually not very heavy on the dialogue. In that sense, I would consider the Disney cartoons to be aimed more towards the younger crowd. Yet what about the cartoons produced by Warner Bros. Animation Studio? While viewed today as being the stereotypical “slapstick” cartoon, the Warner Bros. cartoons took a different direction than the Disney ones. Take for example the famous “Duck Hunting” trilogy starring Elmer Fudd, Bugs Bunny, and Daffy Duck. In that series of cartoons, most of the cartoon’s running time is comprised of Bugs and Daffy arguing about who the slapstick is going to happen to, leading to Daffy Duck being shot in the face. This stands in a sharp contrast with, for example, Elmer Elephant, which is mostly a very dialogue-scarce short except for where it is needed, and is a motion-based cartoon. Thus, could it be argued that the Disney cartoons are aimed at the younger crowd, while those made by Warner Bros. are directed to older audiences? Now, this is not to say that younger children can’t enjoy Looney Tunes or that older viewers can’t enjoy the Disney fare, but the stark differences between the two cartoons stand out. In regards to that argument, I would say that yes, the Disney material does lean more towards the younger crowd, and possessed only a slim variety of plots. The Warner Bros. material, on the other hand, had plots that ranged all over the scale from sci-fi to parodies of operas like “The Barber of Seville” or “Der Ring des Nibelungen”, topics that younger children would most likely not be familiar with. Also, let’s compare the style of animation and the manner of protagonists used in both properties. The Disney cartoons were far smoother in their animation style than those of Warner Bros., while the Warner Bros. material, although fluid, was more static than that of their competitors. Plus, given the dialogue heavy nature of the Warner Bros. cartoons, the more static animation style makes more sense to use than the movement heavy animation used by Disney. 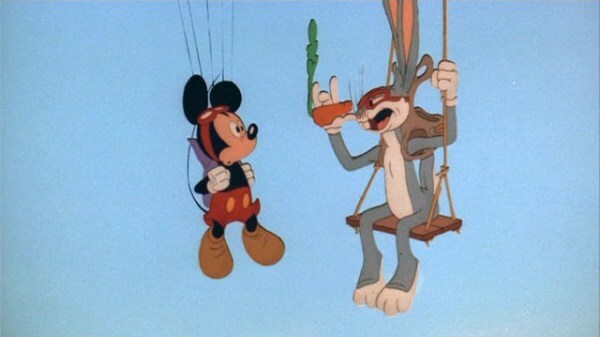 With that now out of the way, let’s examine the two biggest stars of these studios: Mickey Mouse and Bugs Bunny. Mickey is a character that, although he has done some pretty terrible things (like sexually threatening Minnie Mouse in “Plane Crazy”), is generally upbeat and cheerful. Bugs, on the other hand, is a wisecracking smart-aleck who will try to play tricks on his enemies or direct the slapstick onto someone else, as seen in the “Duck Hunting” trilogy where the violence is directed towards Daffy Duck and Elmer Fudd. Also, from my perspective, Mickey’s change into a more wholesome and friendly characters is seen as being antithesis to Bugs, who engages in not-so-wholesome activities such as physical violence and smoking. With both studios’ work examined, the question now is which classic cartoon series is the best? Honestly, my answer depends on what the mood and preferences of the viewer are. For me though, the writing and humor of the Warner Bros. cartoons are closer along the lines of my sense of humor, but, to Disney’s credit, the cartoons they produced were landmarks in animation that led to the birth of animation as we know it.